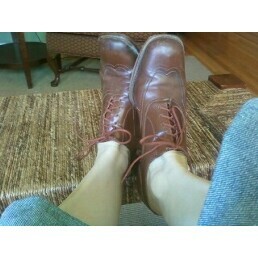 Today I put on a pair of shoes I bought when I was pregnant with Mary Claire. That was 14 years ago. There they sat, on the sale rack at Hudson’s or Marshall Fields, whatever store it was then. Calling my name. I couldn’t fit my fatter-than-normal pregnant feet into the shoe, but I knew they would fit postpartum. The just had to. They were still kind of expensive, even at half off. But I loved them. So, I bought them anyway, stashed them in my closet and looked forward to (hopefully) wearing them someday. And wear them I did. These shoes have taken my feet miles. They were the one pair of shoes I’d pack on trips. I’d wear with jeans, dresses, shorts even. Who cared. I loved them. And my feet loved them. They saw me through years of work and play. I was wearing them the day I ran over my foot with an office chair while hurriedly making last-minute changes to an important speech my boss was making. I’m sure I fractured a bone in my foot. But I just tightened the laces, and hobbled (in absolute pain). I remember my co-worker telling me I was crazy. And I was. The show (and the shoe) must go on. And we did. As time went on, the shoes just got better. Laces were replaced. The leather darkened with age. I oiled them, polished them and loved them. But then, finally, they just got too out of style. So I had to put them away. But I kept them, which is not like me. I’m really good at clearing out my closets and getting rid of the old. Well, lo and behold. Oxford lace-up shoes are back in the game. So, this morning, when I put on my jeans, I reached for those sweet shoes that I dug out of the attic just a few weeks ago. I put them on.